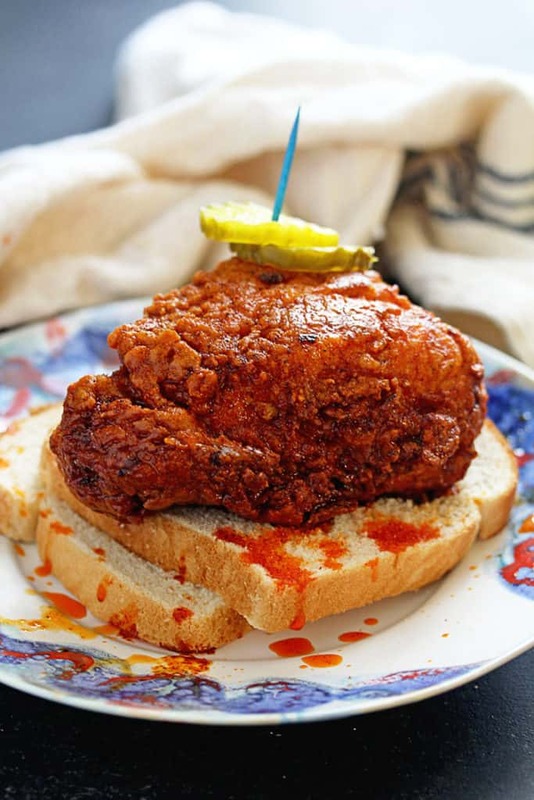 Nashville Hot Chicken Recipe: The ultimate ode to Nashville Hot Chicken. Spicy and crispy fried chicken gets an extra coating of hot oil taking it over the top. This tastes just as delicious as the original ones in Nashville restaurants. When I first wrote this post, I had never had Nashville Hot Chicken but that has truly changed in the past years. I have tried everything from Prince’s Hot Chicken to Hattie B’s, so I feel pretty comfortable saying that this Nashville Hot Chicken recipe is awesome. This seriously tastes like the real thing, and it is beyond addictive y’all. Just warning you upfront! 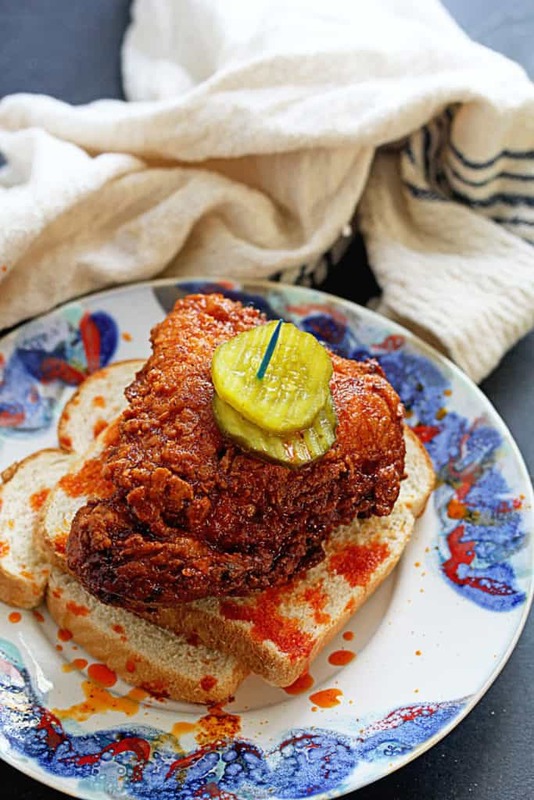 This Nashville Hot Chicken recipe all started a couple of weeks ago when I had the insane pleasure of having breakfast with one of my role models Carla Hall, Top Chef alum and co-host of the hit daytime ABC food show, The Chew. I read the week before that she was opening a restaurant in New York called Carla Hall’s Southern Kitchen that featured this chicken. Carla is not only one of the sweetest and kindest people on the planet, but she deeply understands the emotion tied to food. Carla puts her heart and soul into each of her dishes and doesn’t try to create meals that don’t fit who she is. On top of being a Nashville native, she knows a thing or two about Southern comfort food. I definitely wanted to support her endeavor to make her restaurant dream a reality, and you can help too! Check out her Kickstarter and give to make this epic restaurant the place I will go to without fail every single time I land in New York. The menu, filled with mac and cheese and southern greens, looks insanely delicious! I know this will be a project that will not only yield decadent results but will touch your soul, and that’s who Carla truly is. Now on to this chicken. I stuck pretty close to my original fried chicken recipe for seasoning but added some spice additions based on what I read is traditional for the recipe. This recipe has all of that original kick. I start with a super crunchy crust which comes from a double dredge of the seasoned flour and the hot sauce laced buttermilk. Those two items really create a breading that is unforgettable. Then you have that amazing spiced oil that gets so much flavor from paprika, cayenne and a hint of brown sugar. 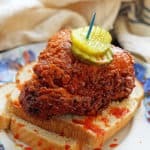 This is the magic of Nashville Hot Chicken, and you can bet it tastes unforgettable in this Nashville Hot Chicken recipe. I’m not sure how authentic this is but it sure did taste amazing. I can’t wait to sample the real thing, especially at Carla’s new restaurant! The ultimate ode to Nashville Hot Chicken. This tastes just as delicious as the original ones in Nashville restaurants. In a medium sized bowl, whisk together buttermilk and hot sauce and set aside. Dip each piece of chicken into seasoned flour and then into buttermilk then back into seasoned flour thoroughly coating each piece. Then add each piece to baking sheet to rest. Finish coating all chicken and let sit for 15-20 minutes until coating has set. While coating sets, add 2 - 2 1/2 inches of oil to a cast iron skillet or heavy bottom skillet and heat over medium high heat. Also turn on oven to 275 degrees. Fry four pieces at a time on each side. Make sure you don’t overcrowd the pan. While chicken is in oven, whisk together 1 cup of the frying oil, cayenne pepper, brown sugar, chili powder, garlic powder and smoked paprika until combined. Brush mixture over completed chicken. To serve, place hot chicken over white bread and serve with pickles on toothpicks. I can’t do a lot of spice anymore, but my family loved it! Thanks for the recipe!! 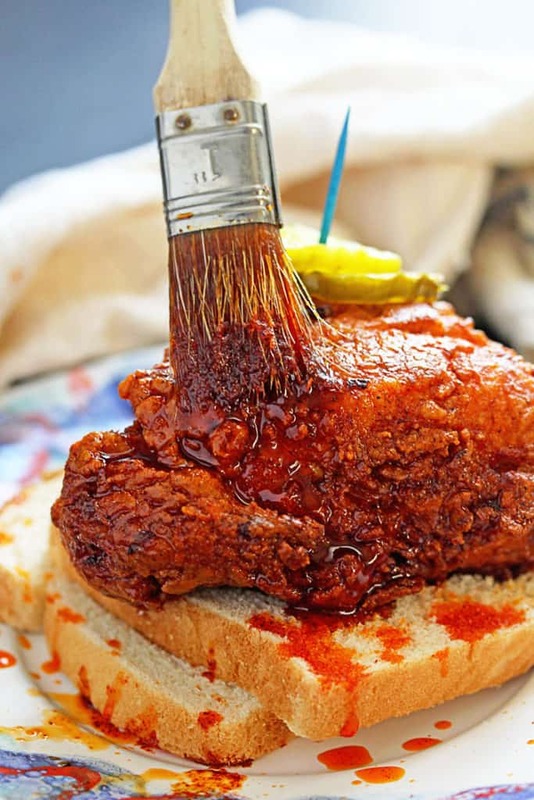 With NASHVILLE HOT CHICKEN recipe can boneless/skinless tenders & thighs be used – this looks MOUTHWATERING! Lucky, lucky lady–Carla is a gem and she has inspired an incredible dish from you! Yes she is a great friend! And now I’m going to break my diet and go eat some hot chicken for lunch! It was such an incredible day! Jocelyn this looks incredible! I’ve had hot chicken a few times since moving to Nashville and it’s always a treat. I’ll have to give this one a try! I think my world needs to be opened up to the great world of Nashville Hot Chicken too! I’m itching to get my hands on that fried chicken! Delicious! How exciting for you to meet Carla!! 🙂 And this chicken, I want, I need!! It’s definitely something that will be added to my dinner menu soon. Wow, those look good Jocelyn! I hope her kickstarted is a huge success! I DVR The Chew and watch it at night! 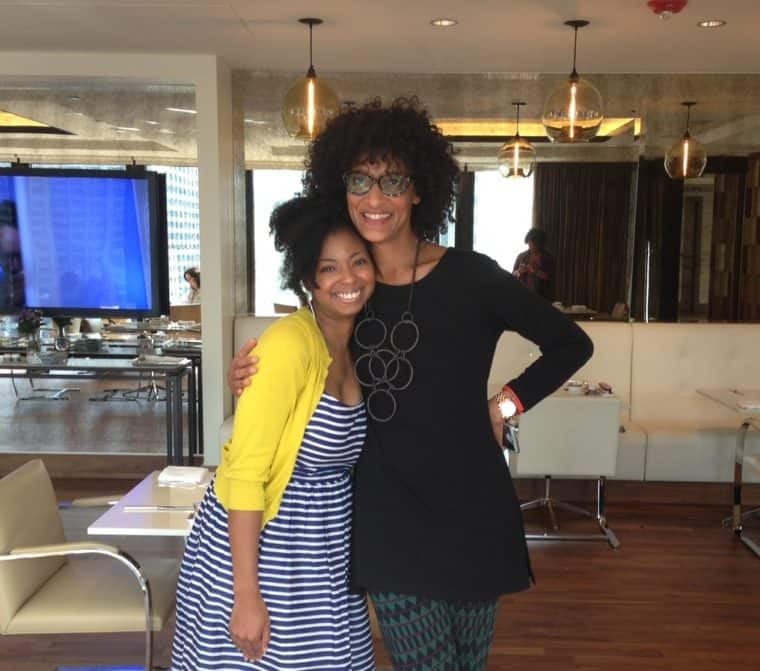 What fun to have breakfast with Carla Hall. I’ve seen Nashville hot chicken on TV but never had the pleasure to try it. Yours looks super delicious (and I’m sure, Carla’s will be)! The Chew is such an awesome show! You’re KILLING me! Killing me. This looks amazing. I have got to try it! Pinned! omg, Nashville’s hot chicken is the jam! I can’t wait to try this! Looks delish! Girl I can’t wait to try it! You’ve really managed to capture the deliciousness of the chicken in your photos here, Jocelyn. Honestly, it’s making my mouth water right now! Girl just rereading this is making me crave some chicken! ALICE I so agree! We all need to go when the restaurant opens. Love love this recipe girl! I loved watching Carla on Top Chef — she was my favorite! What an amazing experience to meet her. 🙂 This chicken has some seriously beautiful, crispy skin! 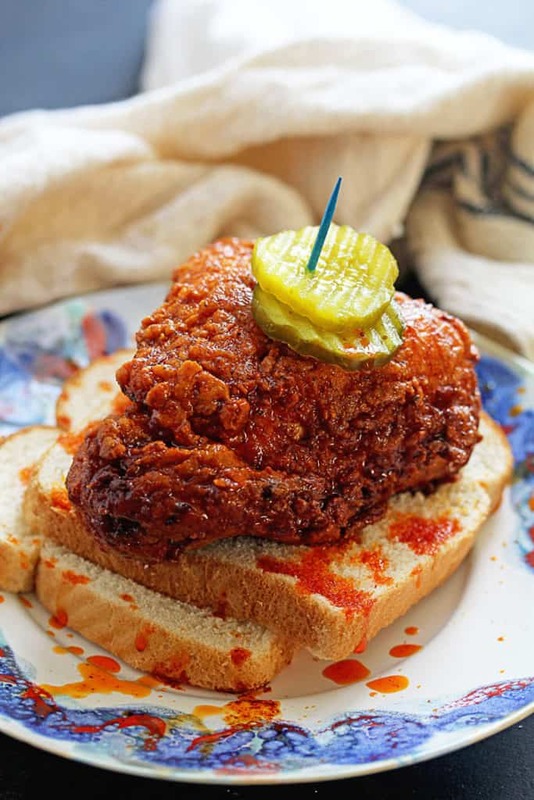 I’ve never had Nashville hot chicken, and now I’m dying to try it! I can’t wait to try it either. I loved Carla ever since I saw her on Top Chef too! Very cool that you got to meet Carla. I have been a big fan of hers since watching Top Chef. I adore her too Laura! Gotta love some fried chicken! Looks great! Love Carla Hall. That picture of the both of you is adorable. Have a wonderful Friday. Hooray thanks so much hon! We all need to go to NYC when this restaurant opens!! I love Carla Hall and love that she understands the emotion tied to food. That’s what it is all about, yo. LOVE your Nashville Hot Chicken and I’m still so thrilled that you got to meet her!! See you soon, boo! We totally all need to head to NYC. That would be such a cool trip! Wow, YUM! This looks like a finger lickin good fried chicken recipe and I think it’s awesome that you got to meet one of your role models. I dream of someday meeting some of mine too. Pinned! Yes Tori, it is such an amazing experience. And I know the same will happen for you. So cool you got to meet her. I bet your personality and hers together is the bomb and so much fun! Yes Melissa it was like a match made in heaven!